Taken from the old road bridge that carried the A171 over the railway at Slapewath (the scene of many minor bumps in the distant past), the picture shows the backs of the houses at Slapewath. 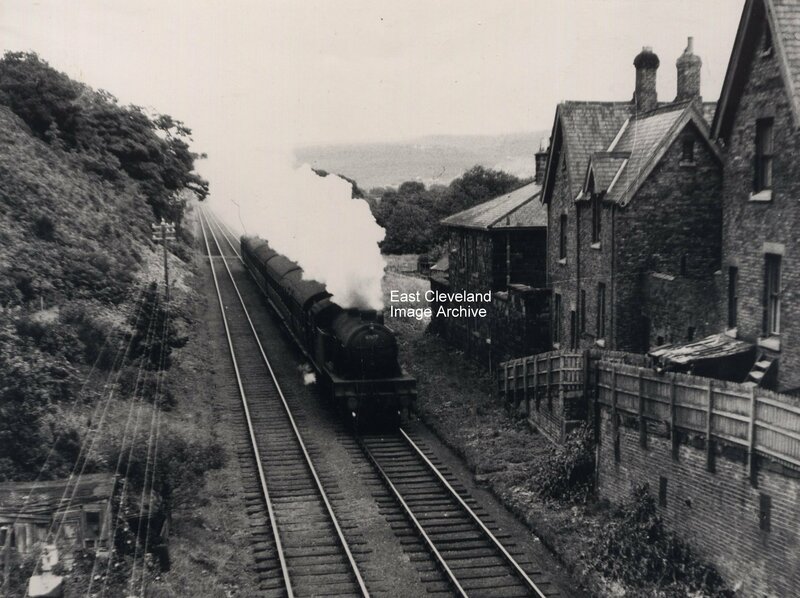 The train is approaching Spawood junction from Boosbeck. It’s difficult to visualise this view now as the A171 re-alignment was so major, I seem to remember two bridges, one over the railway, one over the beck and one rail bridge over the road (to South Skelton or Park) pit) at Fancy Bank (the remains of the railway can be seen on the hillside as a gated forest road). Some of the remains of the old road and rail structures can be seen with the beautiful viaduct at Spawood (now becoming enshrouded in trees) and the road bridge over the beck adjacent partly covered by the modern A171 as it sweeps down Fancy Bank. I think the locomotive is numbered 67678, which would make it a V3 2-6-2T, but it’s not an easy one to see. Can anyone remember when the roadwork on Fancy Bank took place.? Was it before or after the war? At 80 yrs of age, trying to fill in some family history. Would appreciate feed back. Just spent the last six months passing the viaduct daily seeing this fantastic structure slowly become more visible not sure who or why ? But it looks fantastic!